Bead, Czech pressed glass, clear, 8x2.5mm ring with 2.5mm hole. Sold per pkg of 50. 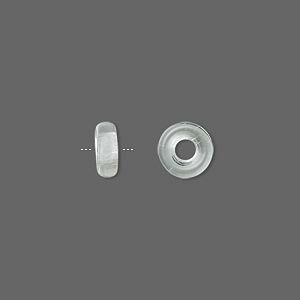 Bead, Czech pressed glass, clear vitrail, 8x2.5mm ring with 2.5mm hole. Sold per pkg of 50. Bead, Czech pressed glass, jet, 8x2.5mm ring with 2.5mm hole. Sold per pkg of 50. Bead, Czech pressed glass, silver, 8x2.5mm ring with 2.5mm hole. Sold per pkg of 50. 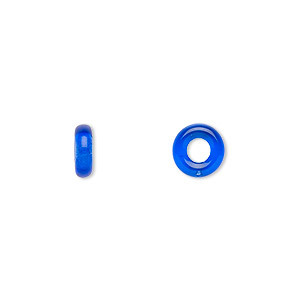 Bead, Czech pressed glass, cobalt, 8x2.5mm ring with 2.5mm hole. Sold per pkg of 50. Bead, Czech pressed glass, emerald green, 8x2.5mm ring with 2.5mm hole. Sold per pkg of 50. 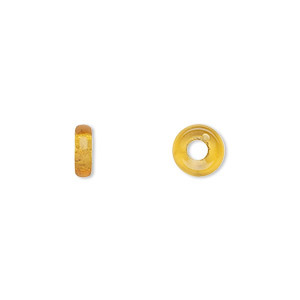 Bead, Czech pressed glass, honey, 8x2.5mm ring with 2.5mm hole. Sold per pkg of 50. Bead, Czech pressed glass, ruby red, 8x2.5mm ring with 2.5mm hole. Sold per pkg of 50. Bead, Czech pressed glass, light red, 8x2.5mm ring with 2.5mm hole. Sold per pkg of 50. Bead, Czech pressed glass, light aqua, 8x2.5mm ring with 2.5mm hole. Sold per pkg of 50. Bead, Czech pressed glass, light cobalt, 8x2.5mm ring with 2.5mm hole. Sold per pkg of 50.